How to Deal with Oily and Sticky Skin ? The feeling of oily and sticky skin is a horrible one. Dirt tends to settle on the top layer of your skin, making you look tired and dirty. It ruins your makeup, and casts a horrible shadow over your natural glow. Excess oil and sebum also tends to clog your pores and cause ugly breakouts. First things first, to control oil and shine you cannot depend only on makeup, you need to follow a daily skincare regime to bring out that inner glow. So here are a few tips to deal with oily and sticky skin, so that you can continue to look clean, healthy, and fresh all the time. 1. Get rid of even the tiniest speck of makeup everyday: Whether you wear just a bb cream and mascara or a full face of makeup, it is crucial to get rid of everything before you go to bed, no matter how tired you are. Makeup that you have slept in tends to make your face look dull the next day. Your skin is also forced to produce more oil as leaving on makeup for too long makes your skin parched and thirsty; and more oil invariably means more stickiness. Makeup, dirt, and grime together is a strict no-no, always remember to takeoff makeup before hitting the sack! 2. Cleanse: Cleansing should be another crucial and most basic part of your skincare regime. You should cleanse your face at least twice a day, once in the morning with a mild cleanser, and once in the evening after you get back home, with a more intense cleanser. 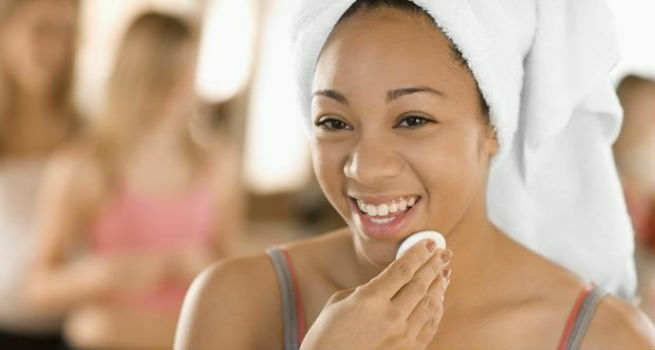 Makeup removers don’t remove makeup and grime completely, there are still traces left behind on your skin. These traces over time build up to give you dull, oily skin, and rob you off your natural glow. So lather on the cleanser and say hello to brighter, happier skin! 3. Exfoliate: Your body cells naturally die and renew themselves. Exfoliation just aids this process and ensures that the cell turnover on your face happens uniformly. Ideally, its best to exfoliate two to three times a week. Exfoliation gently gets rid of the top dead layer of skin, and makes way for new, fresher, and softer skin. It also helps tone down over active sebum glands so that your face doesn’t produce more oil than necessary. This ensures; clearer, more matte looking skin. 4. Use Toner: Use a toner after you cleanse your face always. Among the various things that it does, toner help get rid of any residue left behind by the cleanser. It helps close your pores, minimizing chances of skin infections and breakouts. It also maintains the natural pH of your skin and helps control excess oil production. 5. Make steam your new best friend: Your skin sometimes needs a deeper cleanse than what regular cleansing can provide. This is where steam comes in. Steaming your face helps open up pore and release the dirt trapped inside them. This helps the dirt to travel to the surface of the skin making it easier to get rid off. Steam your face atleast twice a week for fifteen minutes to purge your skin of deep seated dirt and grime. When done, use a toner or ice cube to close your pores, and apply a dime size amount of moisturizer. Do this for a month, and you will start to notice remarkable difference in the quality of your skin. Your skin will be cleaner, clearer, much more luminous. Tip: Following the skin care regime above will ensure that your skin looks healthy and produces only the required amount of oil. But if you are out on the road, and your skin starts to feel oily and sticky, use blotting paper to get instantly matte skin.